Dr. Johnson is the founder of the Smile Foundation he will be leading the 2018 trip. Dr. Cain is a practicing general dentist in Millbrook, AL. He resides in Montgomery, AL. He loves Mexican food. This is his fifth trip to Isla with the Smile Foundation. Claire is head of marketing at Pediatric and Adolescent Dentistry. She is looking forward to her 9th trip to Isla! Karrie is a dental hygienist at Pediatric and Adolescent Dentistry in Birmingham. This is her 1st trip to Isla Mujeres with the Smile Foundation! Jay is an Orthodontist in Huntsville, AL. He is excited about his 3rd time traveling with the team! April is a Dental Hygienist at Pediatric and Adolescent Dentistry. This will be her second time traveling to Isla! My name is Cinthia Bueno. I have been working as a dental hygienist for Pediatric and Adolescent Dentistry for 4 years. This will be my 4th year going to the island! I am super excited and really looking forward to seeing all the familiar faces!! My name is Maria Bueno. I am dental assistant at Pediatric and Adolescent Dentistry. This will be my 2nd time going on a mission trip and am very excited that it will be with the Smile Foundation! I look forward to meeting a lot of new people and helping them in any way I can!! I’m a sophmore at Auburn majoring in biomedical science and planning to go to medical school. This will be my 2nd mission trip and I’m looking forward to the experience. My name is Perry Martin. I can’t tell you how excited I am about this year’s trip! Working with the Smile Foundation has made a profound impact on my growth into a young man, as well as provided me with an incredible opportunity to further immerse myself in Spanish culture. Through this program not only have I sharpened my Spanish-speaking skills and learned the basics of dentistry, but the team members I’ve worked with I now consider some of my closest friends. Ashley Williams resides in Selma, Alabama where she has practiced optometry for 15 years. She is a graduate of Auburn University and The University of Alabama School of Optometry. She is excited help The Smile Foundation provide eye care in Isla Mujeres. Kennedy Walker is an optometrist practicing in Gardendale, AL. She lives in Birmingham, AL and graduated from UAB School of Optometry in 2008. She is honored to be joining The Smile Foundation team. Like dental care, eye care is in such great demand across the world. She is so excited to be providing the gift of sight to those in need. Megan is a dental assistant at Pediatric and Adolescent Dentistry in Birmingham. She will start dental school at the University of Louisiana this fall. This is her 1st trip to Isla Mujeres with the Smile Foundation! Dr. Kersey is a native of Manchester, Georgia and a graduate of Flint River Academy. In 1996, he graduated from the University of Georgia with a Business Degree. After working in the insurance industry for several years, Dr. Kersey returned to dental school and earned his Doctor of Dental Medicine Degree from the University of Alabama School of Dentistry in 2006. Dr. Kersey has been practicing in Lagrange, Ga. since 2006. 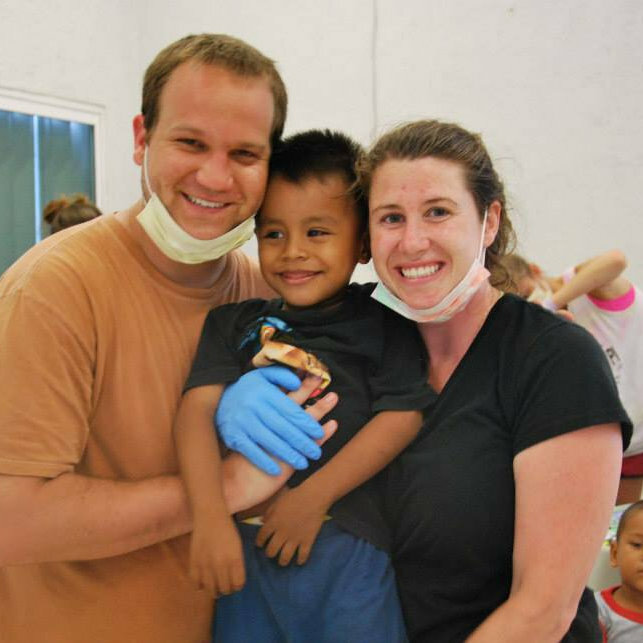 Dr. Kersey volunteers at the Lagrange Baptist Dental Clinic, a local organization that meets the dental needs of those who do not have access to quality dental care. He serves on the board of directors at Synovis Bank and is president of the board at Highland Country Club. Dr. Kersey and his wife, Ashley, have three children. Dr. Kersey enjoys hunting, golf, running, and spending time with his family. My name is Sarah. This will be my first mission trip and I am so excited that it is with the Smile Foundation! I am looking forward to this opportunity. My name is Kandace Maykowski. I am originally from Alabama, but I live in Mississippi and I have been a dental assistant at a children’s dental clinic for 3 years. While working as a dental assistant, I went to Ultrasound school. I am now working as a dental assistant and a Registered Diagnostic Medical Sonographer. I love to help people, go to church, and be with friends/family. God is the center of my life and I love living for him! Betts is the wife of Dr. Johnson and mother of three kids. This will be her first trip with the Smile Foundation. Callie is the oldest daughter of Dr. Johnson. She is 11 years old and is finishing 5th grade at Vestavia Hills Elementary. This will be her first trip with Pediatric and Adolescent Dentistry in Birmingham.